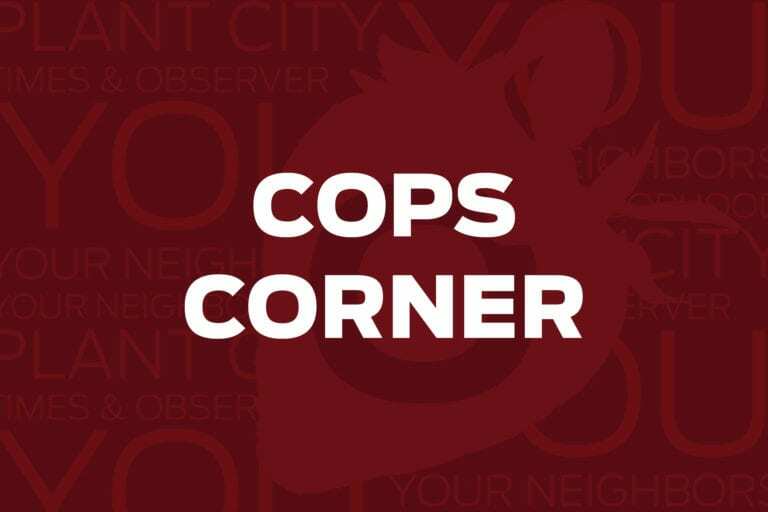 This week on Cops Corner Plant City Police investigated graffiti at a local school, stolen Christmas decorations and more. Petit theft: This complainant told officers that while she was cleaning the mall area of PCHS she put her cellphone down on a table and then went in to clean a restroom. When she came back out the cell phone had been stolen. 2100 block of James L. Redman Pkwy. Shoplifting: Officers came out to this store after receiving a call about shoplifting. A man took $50 worth of clothing and was placed under arrest for petit theft. Officers took him to Orient Road Jail. E. Calhoun St./N. Knight St.
Criminal mischief: Officers headed to E. Calhoun Street to investigate shots that were fired in the area. A residence near the incident scene had damage due to shooting. 4000 block of Airport Rd. Theft: This victim told officers a safety plate, valued at $100, was stolen from his airplane sometime over the past week. 100 block of Birchwood Ave. Theft: A woman told officers an unknown male in a grey hoodie got out of his vehicle and took the plastic Joseph from her nativity scene. He also broke Mary. She said the damage and theft was valued at $300. Information/possible arson: Officers came out to a residence to respond to a structure fire. They realized the home was vacant and Plant City Fire Rescue arrived and extinguished the fire. The State Fire Marshall responded and is working the incident as a possible arson case. 2700 block of Aston Ave. Theft: ’Twas the night before the night before Christmas and this complainant told officers an unknown suspect took several Christmas decorations from the outside of their home. 300 block of Park Springs CR 2. Burglary: This complainant told officers someone cut the screen to her rear porch and then stole a black and blue 10-speed bicycle that was valued at $100. Burglary/criminal mischief: Officers came out on a report of criminal mischief and found that over the weekend someone entered the property and spray painted graffiti on the outer school walls. 600 block of N. Maryland Ave. Possession of burglary tools/criminal mischief, petit theft and molest vending machines: Officers came out to investigate a report of two suspects breaking into vending machines. Two men were arrested and sent to Orient Road Jail without incident. N. Alexander St./W. Baker St. Abandoned vehicle: A vehicle was abandoned in the middle of the roadway near N. Alexander St. and W. Baker Street. It was blocking south-bound traffic. Officers had it towed and entered into FCIC as an abandoned impound after the owner was not able to be contacted. 900 block of W. Warren St. Theft: The complainant told officers that approximately two weeks prior someone had broken into his residence and stolen his 70 inch LG 4K television. The tv was reported as stolen.